The murder of Mary Gregor shocks everyone who knew her. By all accounts she was a kind, gentle elderly lady, sister of the local Laird, Duchlan, & devoted to his son, her nephew, Eoghan.The circumstances of Mary's death are also peculiar. She was found kneeling by her bed in a room with door & windows locked. There seemed no way for the murderer to have left the room & there's no murder weapon to be seen, just a jagged wound near her neck. The only clue is a silver herring scale found near the fatal wound. There was also the scar of a long-healed wound on the victim's chest. How could Miss Gregor have inspired murderous rage not once but twice in her life? While waiting for the arrival of the local police, the Procurator Fiscal, Mr McLeod, calls in Dr Eustace Hailey, a well-known amateur detective who happens to be staying nearby. Dr Hailey examines the murder scene & talks to Duchlan who speaks of his sister in glowing terms, of the devotion of her personal maid, Christina, & the piper, Angus, who performed some of the duties of a butler. His daughter-in-law, Oonagh, was also in the house but had retired early. Oonagh's husband, Eoghan, arrived by motor boat that same evening from Ayrshire where his regiment was stationed. When Inspector Dundas arrives, he immediatly takes charge of the investigation & rejects Dr Hailey's offer of help. It soon becomes clear that Mary Gregor was a deceptively mild character. In reality, she ruled Duchlan Castle with an iron will & brooked no opposition from anyone. Her insinuating ways left her victims with no concrete action or word to complain of but the results of her poisonous tongue were very real. Oonagh had quarreled with her aunt about the care of her son & she had given Eoghan an ultimatum - give me a home of our own or I will leave you. Eoghan was on his way to Duchlan that night to ask his aunt for a loan to pay his gambling debts, a loan that his aunt was likely to refuse as her high moral standards disapproved of gambling. However, Eoghan would benefit greatly from Mary's will as she was the only one of the family with money. Oonagh had become friends with the local doctor, MacDonald, & Mary Gregor believed they were having an affair. She had threatened to tell Eoghan about it, as she had continually sowed discord between Oonagh & Eoghan & interfered with the upbringing of their young son Hamish. As Dr MacDonald was in the house that night, attending Hamish who was prone to fits, he joins Inspector Dundas's list of suspects. However, the locked room & lack of a weapon baffle the Inspector & he eventually has to climb down & ask for Dr Hailey's help with the investigation. Then, another murder takes place with a similar method to the first & the uncanny circumstances, including the discovery of more fish scales at the scene, lead to whispers about the strange creatures from nearby Loch Fyne that the fishermen believe bring bad luck & evil. Could the answer be supernatural after all? Murder of a Lady is an ingeniously plotted locked room mystery in an atmospheric Highland setting. I love books set in Scotland & this one has everything - a castle by a loch with tales of a seal-like creature lurking in the depths; a respectable woman who rules her family with insinuating cruelty; a young woman at the end of her tether & an old man who turns his face from the truth & is completely under the sway of a stronger character. The murders are very puzzling & the fish scales (the book was originally published in 1931 as The Silver Scale Mystery) add a distinctive oddness to the investigation. I enjoyed the character of Dr Hailey. He's kind, sympathetic, but determined to pursue the truth, no matter how much sympathy he may feel for the suspects. He prevents several crimes in the course of his investigation, including a suicide, but can't stop the murderer striking again as he desperately tries to put together the clues. Murder of a Lady is one of the very successful British Library Crime Classics series. I have lots of them on the tbr shelves (& there are more to be published later this year). It's fascinating to have a chance to read these long-forgotten authors. I'd like to read more Anthony Wynne so I hope they choose another of his books to reprint in the future. I love a good locked room mystery & this one was especially fiendish. I haven't read this one but I recently enjoyed a Roderick Alleyn by Ngaio Marsh called Scales of Justice, so as hard as it might to believe, there are at least two Golden Age mysteries involving fish scales! I read all the Marshs in my teens but I've forgotten the details. More fish scales! I'd never have thought it could be a clue in two mysteries. Maybe there are more? I have this on the shelf but haven't read it. Sounds amazing -- what a great series this is. It is, isn't it? I've found myself collecting them & have a lot to read. 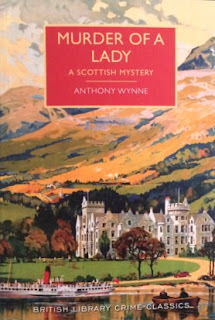 I reviewed this Wynne title very favorably five years ago on Mysteryfile, also have reviewed a couple of others by him on my blog, The Dagger and Death of a Banker. In a genre with so many red herrings, there had to be scales in some books! You were ahead of the game, as always! Interesting to see the cover art(I can't really say more because of spoilers but it's odd). Why no fish on the cover? I much prefer the BLCC cover, even without fish. Of course, there should be fishy clues in every real GA mystery! I am very fond of these British Library Crime Classics reprints. I will add this one to my wish list. 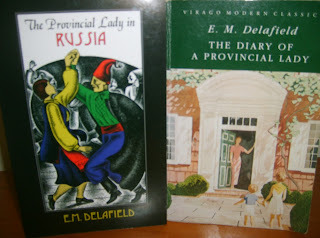 I'm always seduced by beautiful cover art & I love the way the BL have used the travel posters which are gorgeous anyway. They must say pick-me-up-and-buy-me in bookshops. I loved this book too and hope they reprint more of his too. I looked online and its impossible to find old ones to buy. Glad you enjoyed it too! Hopefully the BL (or Martin Edwards who's the consultant for the series) will find another Wynne worth reprinting. I loved this one. I simply LOVE your blog and learn so much about new authors that I've now been reading thanks to you, and also remembering old favourites! Last month I saw your note about Angela Thirkell and ordered her High Rising. I KNEW I would like it, but I actually LOVED it! Except for one little thing.....I ordered the Moyer Bell edition of 2009 [her publisher in the USA] and it was HORRID! There were hundreds, Literally HUNDREDS, of typos!!! Full stops in place of commas, twice in one sentence! Duplicate full stops. Paragraphs interrupted and started again in mid sentence on the next line! It was torture for a proofreader! And really messed up the flow of the story for me.....so just a heads up. Don't bother with those editions at all, and I hope the new UK editions are properly proofread!!! Thank you Kristine, I'm glad you enjoy it. All my Thirkells are the Virago reprints (except for one old omnibus I bought secondhand) so I think they're pretty well proofread. As I keep saying, I haven't read many of them, I'm just buying them (& there are two more on the way to me right now)! I MUST read Thirkell. Your enthusiasm has just pushed her a bit further up the tbr pile. BL is really nailing those covers. I really enjoyed this one too. It was very atmospheric, ingenious, and maybe just a bit tongue in cheek. Everything I want from a murder mystery! I thought you'd enjoy the Scottish setting!